A lot of people celebrated New Year’s Eve in the traditional way — fireworks and champagne — but some people’s lives changed with the start of 2016 as they welcomed some bundles of joy to their families. 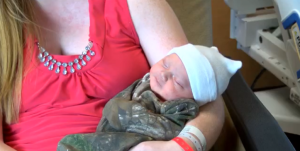 At 12:30 a.m a couple at Woman’s Hospital in Baton Rouge welcomed their baby boy Nathaniel into the world. “He’s our first so it was completely new,” said mom Julie. Nathaniel weighed in at a healthy 8 lbs. 6 oz. He was a New Year’s surprise for his parents arriving four days late. “We got here at 5:30 in the morning and on the 31st, he wasn’t born till the 1st,” said dad Matthew. Nathaniel was the hospital’s first born, but Julie wasn’t the only mom in labor when the clock struck midnight. “Considering there were two other in delivery it was pretty exciting,” said Julie. And what makes Nathaniel’s birthday seem more fated are his initials! “It’s coincidental that his initials spell NEW,” said Julie. Julie and Matthew say they don’t do much on New Year’s Day, but that will change as they celebrate their new baby boy. “We happy he is here. We are very blessed to have him,” said Matthew. Click here to view the story from WVLA. ← New Year’s Resolution for Caregivers: Reclaim Your Life!